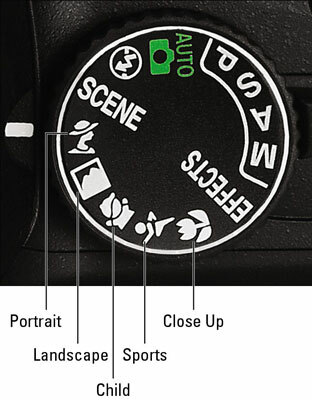 Primary Scene modes: Five modes are deemed popular enough to have their own address on the Mode dial: Portrait, Landscape, Child, Sports, and Close Up. Just rotate the Mode dial to the icon representing the scene you want to shoot, and you’re good to go. Secondary Scene modes: For the remaining modes, set the Mode dial to Scene. The Shooting Information display then shows an icon telling you which of the secondary Scene modes is active. Keep rotating the dial until the mode you want to use is selected. Close Up, Candlelight, and Food: In these modes, the default setting is Single Point AF-Area mode, which bases focus on a single point instead of all 11. Initially, the center focus point is selected as the target, but you can use the Multi Selector to move the point to a different position if necessary. (Sometimes you need to give the shutter button a quick half-press and release it before you can select a new focus point.) Remember to frame the picture with the selected point over your subject before you press the shutter button halfway when autofocusing. Sports and Pet Portrait: These two modes set the AF-Area mode to Dynamic Area. You start by selecting a single focus point, as with Single Point mode, but if the subject leaves that point, the camera looks to other points for focusing information; it’s ideal for focusing on moving subjects. Just make sure to adjust framing as needed to keep your subject within the area covered by the 11 autofocus points. All others: The rest of the Scene modes use the Auto AF-Area mode, which means that the camera considers all 11 focus points and typically focuses on the closest object. You can use the Quick Settings screen to change the AF-Area mode setting if you want.